The Buttonwood Bonsai is a unique tree that is sometimes dismissed as unattractive or less than worthy of the species but it can also be said to have a distinct artistic presence. The ancient reputation of the Bonsai for being a survivor of time, yet delicate in nature, is no better displayed than with the Buttonwood Bonsai. This specimen makes a great starter plant for healers to nurture and coax into bloom. As the appearance of deadwood takes shape into a beautiful swan, all of your patience and efforts will be rewarded. Description The tree is sub-tropical, and grows in damp, rocky locations. It is gnarly in appearance, with driftwood-like characteristics. Position Grow the tree in sunny sites. When grown indoors, it needs plentiful light, good air circulation and warmth. It cannot tolerate cold conditions, and will wilt if exposed to temperatures that dip below 500 Fahrenheit. Watering Water the tree regularly to mimic the conditions of its damp natural environment. Feeding Fertilize the tree regularly with a bonsai fertilizer. Leaf and Branch Pruning Clip and prune the tree on a regular basis to keep the leaves small. Prune roots to contain the size of the tree. Re-potting & Growing Medium When re-potting is necessary, do so in late-spring or early in the summer. Easily-drained, gravelly soil is optimal for the tree, but good-quality organic soil may be used. Notes Keep the dead wood clean by regular brushing. This discourages wood rot. The Kisuu Mokuzai Han Seiki or Conocarpus erectus are other names for the Buttonwood Bonsai that is believed to have first begun life in the Caribbean Basin. Through tidal waves, hurricanes and exposure to salt water fury, the Buttonwood not only survived the wicked conditions of the tropic but was plucked up and tossed into the Keys of Florida. Although the Florida Keys can be just as torturous with high winds and storm conditions, the staple plants found a bed of marl just off the coast and in Mangroves. Natives used to carve buttons out of the almost petrified wood, thus, the Buttonwood Bonsai. 5,000 years later, Florida is blessed with their own special type of Bonsai, readily available to be taken home and cared for. Picture a gnarly piece of deadwood that looks as though it would make a great fire starter and you have the making of a Buttonwood Bonsai. 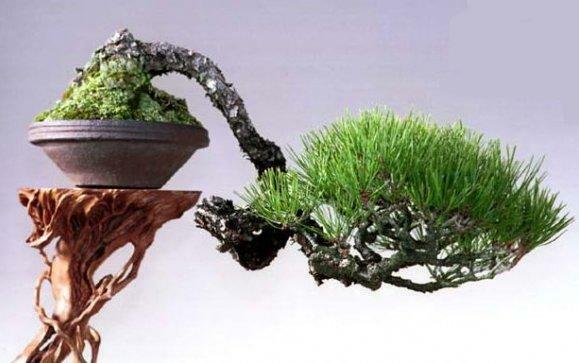 Although unattractive at first, many Bonsai lovers would take this type over many of the other lovely species. Spending time and tending as one would a sick pet, a magical transformation begins to occur. The tired, wounded warrior slowly starts to sprout life when proper cultivation and care is given. It is a magical scene to watch and to know that you played an important part of the process. Although many Buttonwoods are found close to salt water, they cannot survive very many seasons of the ocean spray with perishing. All the more phenomenal that so many plants can be found. Choose your plant in the spring or summer months as they will have a better chance for being transplanted. Clip the roots, never tear away from the rocks and plant in either a mixture of gravel, calcined clay and soil or plain organic potting soil for buttonwoods. Start out your new plant in a low container and find a nice sunny area on the west or southeast area of your home or outside in warm climates. Because these plants are sub-tropical, never allow your Buttonwood to get below 50 degrees and also remember that plenty of water is needed to remind them of the damp, moist area from where they came. Although you may get excited in noticing sprouts toward the base of your Buttonwood, these have to come off. Strip away the old roots and transplant into a new container. Also if you see leaves emerging from the branches and these should be cut in half to allow the new buds to appear. The old leaves will eventually fall off and the new buds will prosper and grow. Spray any branch areas with liquid fertilizer that appear stubborn to bud. This entire process can take anywhere from one to two years before you can begin the training process. You may have a system in mind on how you would like your Buttonwood Bonsai to take shape but if you are new at the game, read as much as you can on the different techniques of training the branches. This species will deliver little bunches of ball-like glands that add even more fascination to the tree. Even before this unique Bonsai was named for the buttons it helped produce, the little flowery balls were called ‘buttons’ centuries earlier. There is no better feeling than to take a tired old branch that has been left to die in the muck and turn into a work of art. The Buttonwood Bonsai is one of the most astonishing examples of how beauty is in every living thing when we take the time to nurture and care for properly. Your Buttonwood Bonsai will become much more than a hobby but a reminder that there is good in every living thing once we stop and notice.